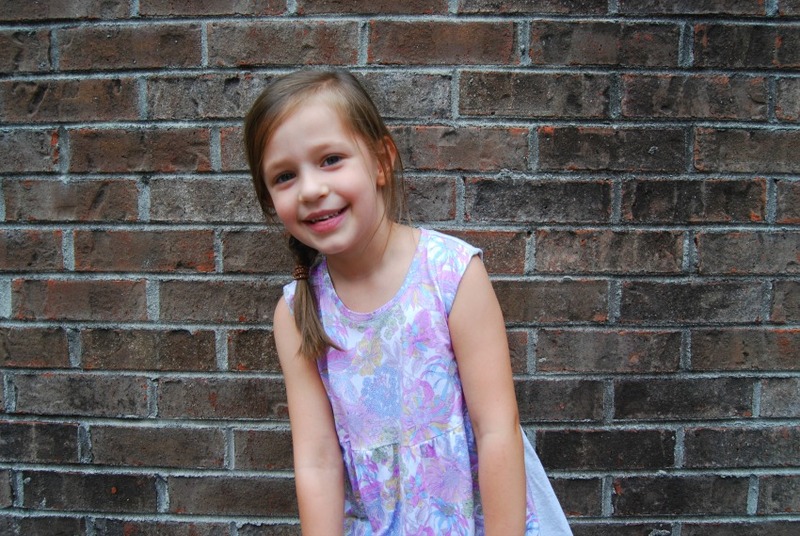 My girl is about to start kindergarten! I can't believe it. She is so ready. And fortunately for me, she's coming to my school. We are so excited to go to school together every day. I might even have her in my art class, as long as she doesn't get the traveling art teacher. Will she call me mom? Who knows. The other kids slip up and call me mom all the time anyway, which always makes me giggle. I decided to make her a few new tops for school. I like to save larger scraps of fabric from my projects thinking I can make something for Jane. It's about time I actually got around to it. The two floral pattern tees are actually recycled from two of my old tees. And the black and white fabric is a piece I saved specifically to make her something. Now that I've made these cute tops and have worked out the fit, I need to see what other knit scraps I've saved and make her some more. 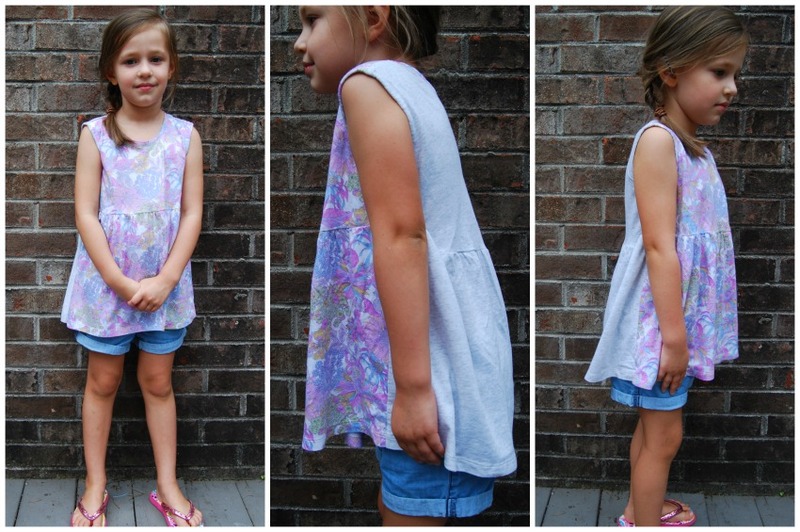 Kids clothes are much faster to sew than adult size things. And she's very appreciative at this age. 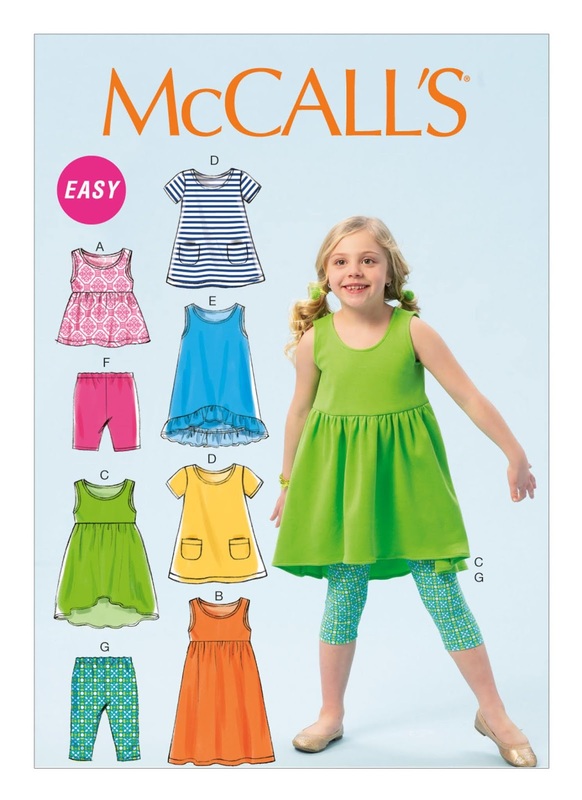 Pattern Description: I used McCalls 6947, which is unfortunately out of print now. I've had it in my pattern stash for a while. I actually used it last year to make her a dress (the patch pocket variation), so I knew what the fit was like. It's a pattern with lots of options for dresses, tops, and even leggings, which I have not made. Pattern Sizing: The pattern is sized 2-5. I used a size 5. I made a size 5 last year, too, and it was big then. I figured the five would be a better fit now. Jane is a pretty standard size 5 in rtw except she is long. Long though the body. These three tops are still running a teensy bit big in width, but that's a good thing as she'll grow in to them. I added a bit of length to the bodice from the get-go, maybe a half inch. Fabric Used: The two floral fabrics are recycled from two of my tees. Of course I didn't take any 'before' photos. Do you remember when Uniqlo had the Liberty collection? I bought three tees then and only ever liked one enough to wear it. The fit was off on all three. The fabric, however, was beautiful. So I saved the two tees with the intention of using the fabric for something. Jane got a glimpse of the one with the rainbow colors in it and was all about it. Anything rainbow these days. Both fabrics are a cotton/viscose blend. The black and white fabric is a remnant from a rayon knit I bought at Joann's. I'm pretty sure it was one of their Nicole Miller fabrics. I wish they'd bring back the Nicole Miller stuff. It was decent quality compared to the stuff I've seen there lately. Alterations/Deviations: I used the bodice and sleeve pieces from view A but the gathered portion is different on all three. I used the pattern piece as a general guide but the fact that these were all made from smaller pieces of fabric dictated the length and width. I made the rainbow floral one first. I used the bottom of the top (it was a swingy tank top) for the gathered portion after I cut the bodice and sleeve. I really wanted the sleeves on this one so I sacrificed a lot of length. It ended up very cute, but short. I added the navy lace trim to give it a bit more length and I think it's my favorite part. Though she won't be able to wear it much longer before it's a belly shirt. 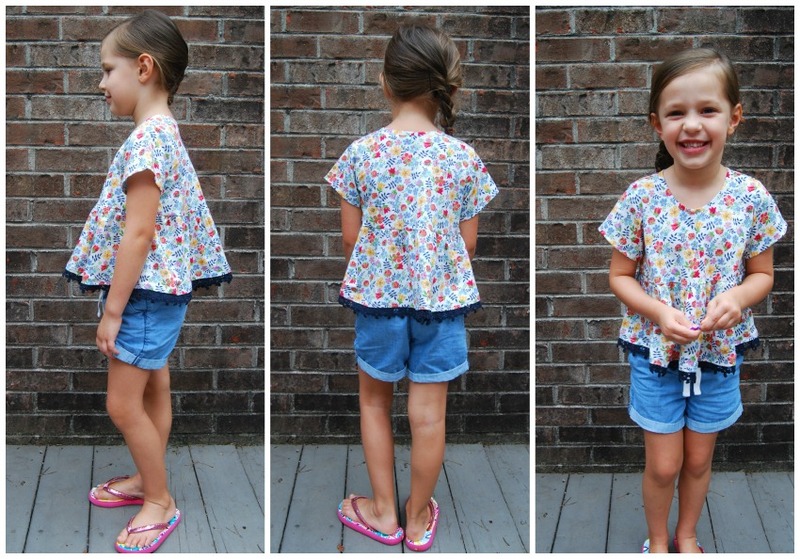 The pink floral top came from a tee (front was floral and back was that solid oatmeal color). No sleeves so I could get all the length. I went a little longer on the length so it's more of a tunic. Both of those don't have all the width due to fabric constraints, so not as much gathering. The black and white version is the actual length and width of the pattern. I did a regular tee shirt neck band on all three instead of a binding. Likes/Dislikes: I really like all of them and so does Jane. Of course the rainbow one is her favorite, although she really likes the pink floral one, too. No dislikes. 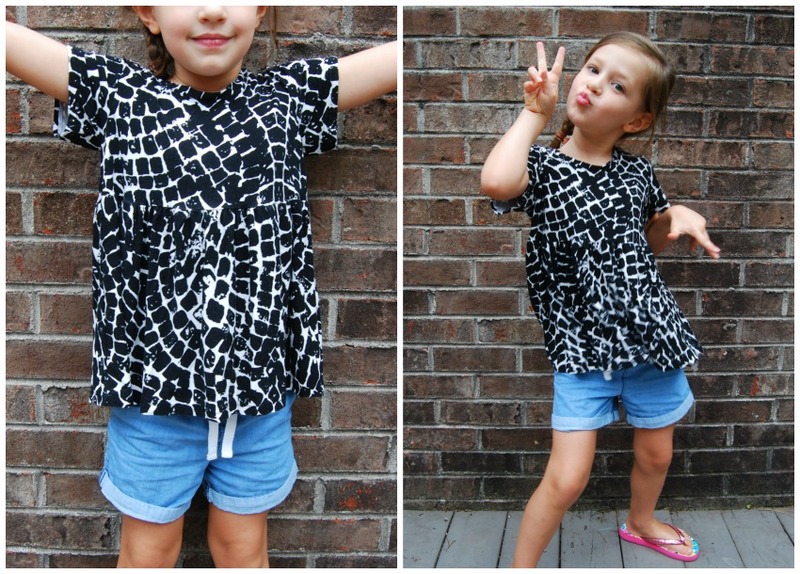 The black and white top is a super stretchy fabric, so I bet she can wear it for a couple of years. All in all, it's a nice, useful pattern. I actually am sewing her another variation right now from some recycled fabric and have a dress planned if I have time before school starts She's starting to make requests. Good thing she's fun to sew for! Welcome to Kindergarten little one! You made such cute tops for your daughter, I can see why she likes them. She is adorable! 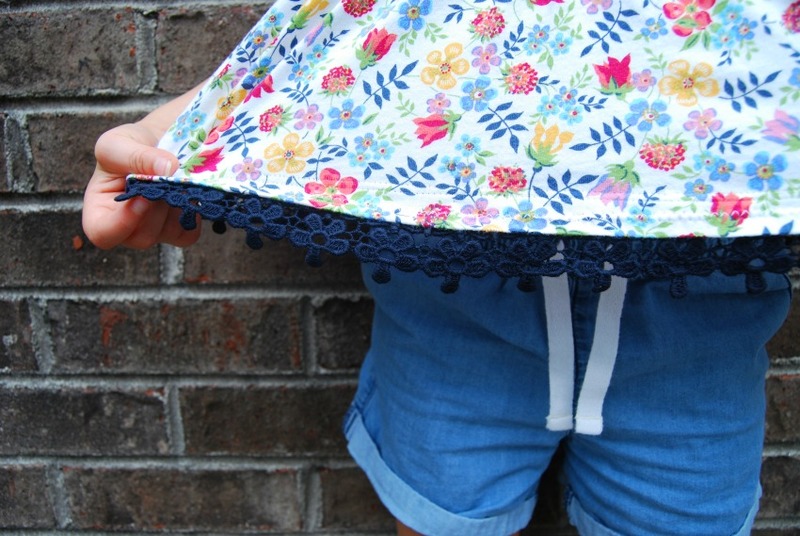 I miss sewing for my kids when they were that age; fitting is so much easier when they are little and you can sew with all kinds of fun fabrics. It is easy to sew for her right now! And the best part is that it only takes a little bit of fabric. Lovely clothes on your beautiful daughter. Sewing for little girls is so much fun. I haven’t sewn anything for the boy yet! They look great and super fun—that’s awesome that she’s excited for stuff you’ve made her. But how on earth is she starting school already????!? Ha, I secretly love it when my students call me mom, too! 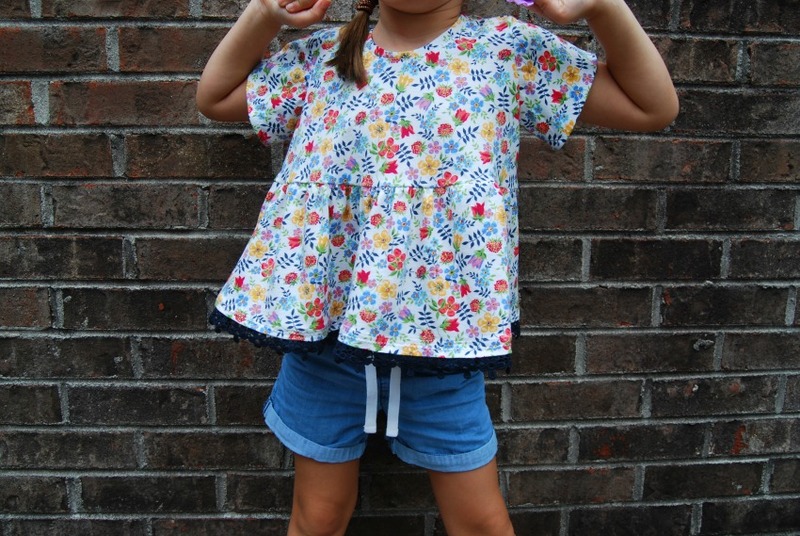 She looks like she's having a great time mugging for the camera, very happy and comfy in her cute new tops. Congratulations on this milestone and yay, back to school!